How often do you consider yourself to be a total loser when it comes to your productivity, time management, and motivation? It seems everything is more likely to crash then happen, the way you’ve planned it, let’s just say I know the feeling. I’m deeply concerned that every single human being is in need of motivation that leads people to success. We are all desperately struggling against our laziness, as we do tend to have problems with smart time management and productivity. Everything big starts from the small, and I do believe that being productive is not a dream, it is an achievable task. The point is how you manage to accomplish it. How to have a great day, week, month, and year? Are there any golden rules, and do they really exist? 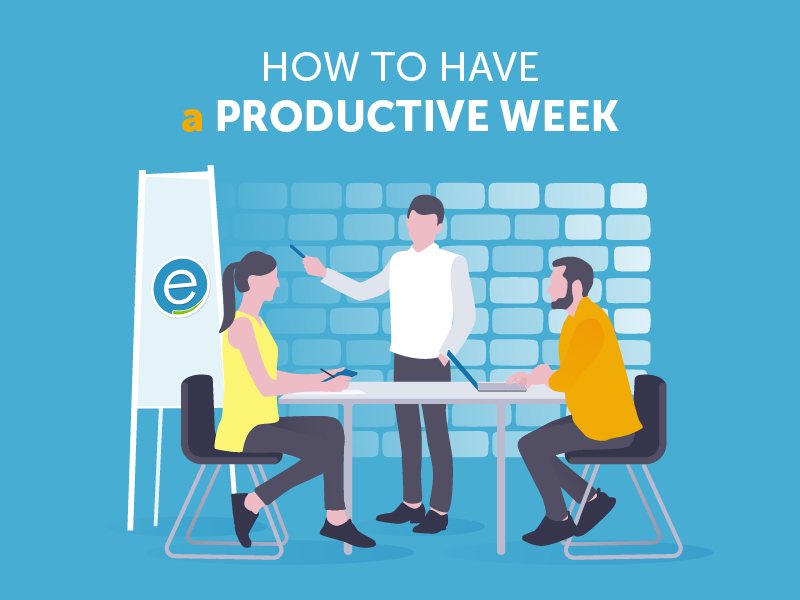 Let’s start with the most convenient time-frame for starting practicing our productivity, and set our own key points for the greatest week ever. Become your best self ever and reveal yourself the world of productivity because you are and must be productive no matter what! The more accomplished goals and tasks you have, the better your productivity is for sure. In your everyday chase for success and productivity, mind that it must be only one specific task to complete for the upcoming day. Make sure you are realistic and specific enough, don’t pretend to be Iron Man, and let’s be honest, who needs that? Surely, you may put more than one task for the day, but do you really feel that being overloaded and stressed because of too many tasks does help you? Keep it simple, and watch out how everything works! In an astonishing and strange way, note taking motivates me to complete the set goals and do everything on time. I should admit that writing my things to do, I clearly remember all the information and somehow more likely to commit all tasks. I’d compare it to the process of setting an alarm: once it rings, you wake up. This way you kill two birds with one stone as you are planning your upcoming day and increasing the possibility to complete your goals, what to say about setting your priorities which is a great thing for sure. If you aren’t into writing at all, thankfully Google Calendar is always at your service. Sometime later, you start savoring all those available notifications set reminders, color-coding your plans, and collaborating with others. Another useful option is your phone when you need to focus on a specific assignment or task; setting reminders and alarms do help. What a simple and at the same time effective method to meet any upcoming deadlines and not forget anything significant. I doubt that you’ve never heard about the Pomodoro technique, which is a scientifically proven technique that does work when you need to be super productive and keep your attention span focused on your goal at hand. One of the simplest things in use ever, just set your timer every 25 minutes for your intensive work and then have your faithfully deserved 5 minutes for a break. It might be really hard to get work done at your apartment due to the various distractions, no matter what your distractions are, all you might need is another environment. Don’t try to cope with them and make your place the most productive one to get everything done, instead get a change of scenery. Besides new place and atmosphere, no matter where you go may inspire and motivates you even more. We tend to disregard this point mistakenly thinking that it has nothing in common with our productivity. After a hard-working day you must take some time for yourself and relax if you want to be and stay productive and you do want that, don’t you? It’s totally okay, and even more, it’s a must! Using essential oils makes the whole relax process incredible and the most enjoyable thing ever. Super easy in use and super relaxing in practice, the choice of your favorite oil depends on you and your preferences. The one that is my complete love and best is eucalyptus, starting from the aroma and the calming effect it has on me. Make your own aromatherapy right at home and even the worst and busiest day will go away. Staying late at night is surely a killer of your overall productivity, mood, and concentration. You will feel sleep-deprived and groggy the next morning and the whole upcoming day. Getting 8 hours of sleep is a need, not a whim. If you do tend to abuse staying late, sleep 8 hours and feel the difference in how you are functioning and your level of productivity changes. This goes without saying as the previous tip about proper sleep. I’ve tested it on myself saying “no’’ to all fat foods and “lazy evenings.” The results speak for themselves. When you eat and exercise, be ready to feel cleaner and healthier, have higher energy levels, having more power and less stress or irritation at all. I found myself not only functioning better which is undoubtedly my favorite benefit, I’ve become more confident and motivated to continue like that. Are you still sitting and watching Netflix at home every single evening? Drop it, take a brisk walk before bedtime, believe me, it’s much better than the episode of your favorite series. You might say that’s boring and tiring. But what about the way you feel the next morning after staying late eating your fast food during your Netflix series? Shouldn’t you at least try to notice the difference? Have you known that increasing your mood you are increasing your productivity? So go ahead and listen to your favorite lists as you do need some inspiration and motivation somewhere to arise. Any time you’ve thrown yourself into the pile of works and tasks, remind yourself what the most important ones are. In order to complete all tasks and goals, you should prioritize first, you aren’t able to accomplish your entire To-Do list for the day, it does take some time. When your time management is okay and you start with the most important tasks, you’ll get everything done with no stress. How much you’ll get done depends on how well you are at prioritizing. The last thing to keep in mind is your rewards. Pampering yourself continually anytime you’ve deserved makes you feel an incredible productive human being ever!